2- Reduced wage costs: Though automation did not reduce jobs in the past, this can change. 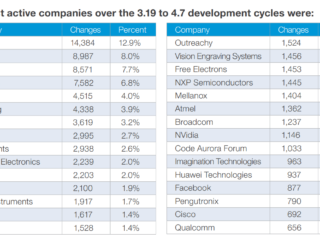 RPA vendors estimate 25–60% cost savings due to RPA roll-out. Leading AI experts like Andrew NG also predict AI will lead to loss of jobs for those those who work in automatable jobs and lack the skills to be successful at jobs that can not be automated. These predictions are becoming more believable as they are uttered by CEOs of major banks. As CEOs in an industry that is tightly regulated companies, they need to be careful when talking about headcount decreases. Neither the public nor the government would be happy to hear that people will lose their jobs and inevitably negative perception about banks influences regulatory decision making. So CEOs wouldn’t be talking about headcount decreases if they weren’t 100% sure that they would happen. So I believed John Cryan, CEO of Deutsche Bank, when recently said that a large number of bank employees would be replaced due to automation. Therefore, it is clear that automation will make some positions redundant. There could be 3 possible solutions: employing personnel in other functions, upskilling personnel and letting go of personnel so they can find opportunities in other companies. If relevant opportunities exist in the company that fit these employees’ skills, that’s the easiest solution. There could also be opportunities for the redundant personnel to upskill themselves and start new positions in the company. If relevant opportunities for upskilling do not exist in the company then with a generous severance package and coaching, redundant personnel could be incentivized to upskill themselves and work at an environment more suitable for their skills. Even when current headcount is preserved, enabling automation will make your personnel aware of automation opportunities and keep departments lean. 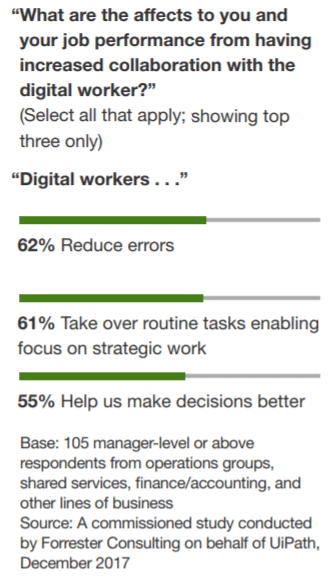 4- Reduction of data entry errors and other manual errors: As you can see in the snippet from Forrester Research’s survey of UiPath customers, managers see reduced errors as one of the primary benefits of RPA. Afterall, one of the greatest benefits of automation is that machines do not get distracted! Once the RPA setup is complete, manual errors are eliminated. Customers will no longer need to complain about errors that you introduce to their data. These errors are some of the hardest to fix as your customer rep may not be able to correctly identify the customer on the line due to data entry issues. As a result, customer may need to go to a face-to-face channel which takes significant time and effort especially for busy professionals. However, this does not mean that RPA provides error-free operation. Edge cases that were not part of test cases have potential to cause RPA bots to malfunction. RPA operations should be checked from time-to-time to ensure that edge cases are also covered successfully by RPA bots. 5- Faster service: Back office processes hold back the speed of your business. Employees manually entering forms into systems or copying data between systems hold back your service speed. Bots work at lightening speed without break. 6- Improved data quality: Reduction in manual errors lead to higher quality data, enabling more reliable analyses. 7- Increased scope for data collection: Robots interact with legacy systems uncovering data that was previously labor-intensive to extract. This enables analytics team access more data which leads to more accurate analyses. 8- Reduced workload: Automating reports is especially valuable for the analytics department, allowing them to focus on more sophisticated, custom analysis. 9- Employee satisfaction increase: No one wants to spend all day copying data from one system to another. Appreciation of work emerges as one of the strongest driver for employee satisfaction in numerous studies like this BCG study. 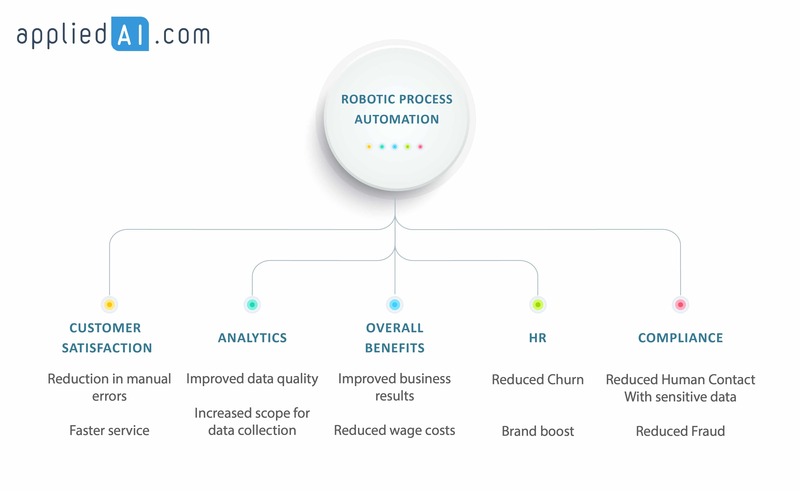 RPA has the potential to increase employee empowerment. 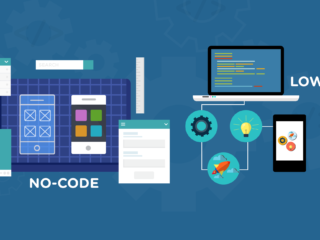 Especially solutions like no code RPA aim to democratize automation development. If employees can build and maintain their own automations, it is a significant empowerment for them. They can focus on more interesting and challenging tasks, increasing their job satisfaction. 11- Employee brand boost & reduction in hiring costs: This is an indirect effect but reducing manual labor boosts satisfaction and makes a company more attrative, facilitating hiring. 12- Reduced workload: As business users are empowered to automate their processes, IT will get less small automation requests. 13- Improved focus: Focus is key for any department. However, focus is especially critical for IT as IT has the challenging tasks of serving all departments. Having less automation related work allows IT to focus on more important technology problems. 14- Thanks to RPA, human contact with sensitive data can be minimized, reducing probability of fraud and compliance issues. 15- Audit trail is maintained, allowing detailed audit in case issues arise. McKinsey’s interview with Leslie Willcocks highlights most benefits of RPA. Great information shared about RPA. 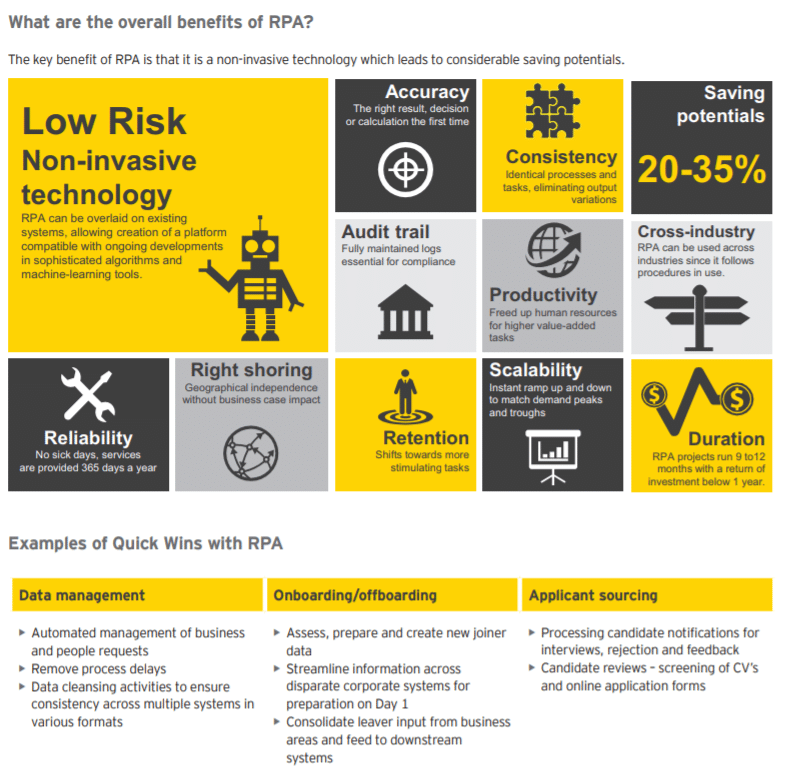 RPA if it is implemented many industries can boost their productivity and increase in ROI. Hii…It was so interesting to read such a unique content on RPA & I feel thanks to you for posting such a good blog, keep updates regularly. May I quote from this Blog? Sure, please. Would you mind letting us know where? Hi can I publish this on my website (in development phase).